Implementing the perfect search that helps customers navigate to the right content as quickly as possible can be tough. But, don’t panic, it needn’t be difficult! Discover how to build powerful search into your website with Algolia and a headless CMS. Before getting to a feature level, first ask yourself why you need a website. As we run through this article we’ll reflect on our own website story, which started in early 2017 when we decided to unify our product offering. Simply put, we merged several products into one. Of course, we had to align our product website with that – and by the way we did it one day! As our developers and marketers collaborated together to deliver the website, we decided there was no need for powerful search functionality at the very beginning as we only had a few blog posts. 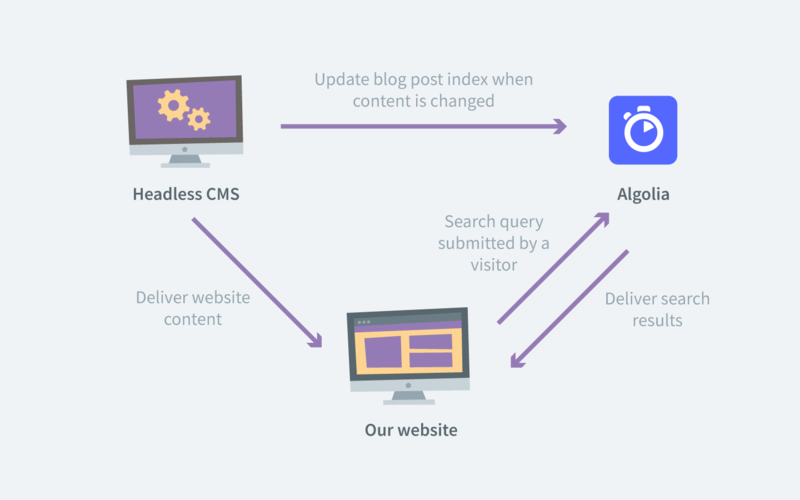 By committing to a headless approach, it meant that we didn’t have to define our future search requirements at the beginning and validate if it fit our Content Management System (CMS) capabilities. This is what we would probably have done, had we decided to go with traditional CMS. For us it was more important to know that there is always an option to extend website functionality, for example including proper search capabilities, if needed in the future. It’s amazing what you can do differently with a light-weight microservices architecture - that’s why we chose a headless CMS. The beauty of headless CMS’s is that they don’t overwhelm you with tons of features you never use, complexity, and a difficult learning path. Instead they focus on what they do best – providing content as a service. On top of that, headless CMS provides great integration options to extend functionality if you need more. New cloud-based API services makes integration even easier. It’s totally up to you to choose a provider of requested functionality. And, you can change it in the future without too much effort, giving you all the flexibility you need. As mentioned there was no search functionality at the very beginning, but when the number of articles increased, we wanted to make it easy for website visitors to consume the content they wanted. Having the website powered by a headless CMS gave us freedom of choice from multiple best of breed search service providers, including Algolia, Azure Search, Elastic, Swiftype, and others. We didn’t want to spend days or weeks researching and testing different search platforms – we wanted to get started quickly with something and adjust/replace in the future, if necessary. In general we favor an agile approach, and microservices architecture greatly supports that. We conducted some very brief research. We held a discussion with our internal team, asking them about their personal experience with different search engines, and checked some online reviews and comparisons like stackshare.io. After one day (yes, we time boxed this exercise) we ended up with Algolia. I am sure you will need spend more time on research if you have more sophisticated requirements. If your requirements are similar to ours, or you're looking for something more complex, explore Algolia, as it provides all the search and discovery capabilities you may need, including Standard search, Voice search, Analytics, A/B testing, Query rules and more. If you're interested in more technical details, you can read a deep-dive article about how we connected content and search services together to create an appealing search experience on our website. We tested it, and clearly reaped the rewards when we implemented our website, and now our visitors have a better search experience. Why not give microservices architecture a try? If it's something you're interested in, get your hands on a free 30-day trial of Kentico Cloud, choose a small project to test it with, and you will be surprised at how powerful it can be.